A pizzelle maker is a great addition to a baker’s cooking arsenal, particularly those who love making cookies. Not many people know that a pizzelle is one of the first cookies ever made. Its origins traces back to centuries ago. Pizzelles make for great snacks during Easter and Christmas. But there’s no reason to reserve making these cookies for special occasions only, especially when you can easily make a batch at home with the right pizzelle maker at your disposal. You can make a big batch for your friends and family or even whip up some for a party. If you are currently looking for a nice pizzelle maker that you can add to your kitchen, you are definitely in the right place. 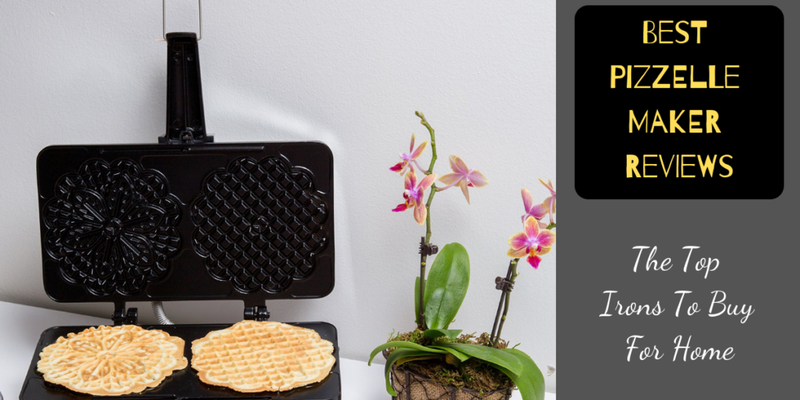 In this article, I will be sharing with you a bunch of information about how to make pizzelle, how to use and clean pizzelle makers, how to choose pizzelle makers, and a list of the 5 best pizzelle makers you can buy online today. We chose these products based from their reliability, ease of usage and value for the money. Read on to find out more about pizzelle makers. How To Make A Traditional Pizzelle? Unlike your usual chocolate chip cookies, pizzelle cookies are a lot easier to make. To make traditional Italian pizzelle cookies, all you will need are eggs, flour, butter, sugar, and a bit of flavoring. Once the dough is made from these ingredients, all you will need to do is place the batter in the pizzelle maker and wait until it develops into a crisp or soft flat cookie. The pizzelle making process is very similar to making waffles. Pizzelle makers are very similar to waffle makers. To properly use one, simply brush the pizzelle maker with oil first to ensure that the dough will not stick to the iron after cooking. Once the pizzelle maker is all greased up, all you need to do is heat up the plates and drop the dough onto it. When placing the dough onto the iron ﻿﻿plates, make sure that you are covering every bit of the plate to ensure that you will get an even shape. After placing the dough in the pizzelle maker, simply close the iron lid and wait for it to stop steaming or until the light indicator goes off. Upon opening your pizzelle maker, you should then find a soft or crisp cookie with a golden brown color, just ready to be devoured. To properly remove the cookie from the iron plate, start by picking off the cookies from the sides until you reach the center. After using your pizzelle maker, let it cool down for a couple of minutes before wiping it clean and storing it away. 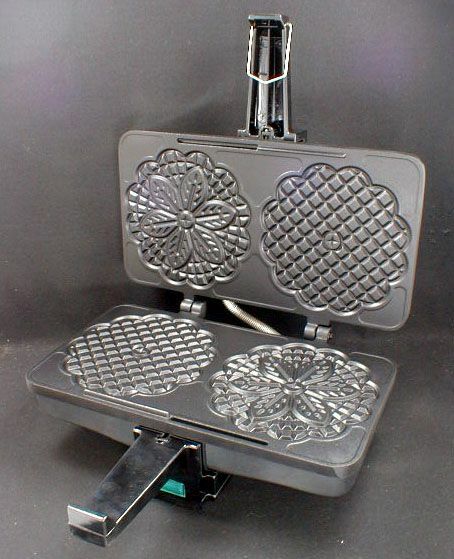 The cleaning methods for pizzelle makers would depend on the kind of your pizzelle maker. In today’s market, you will be able to find three kinds of pizzelle makers: traditional stovetop irons, bare-metal electric irons, and non-stick pizzelle makers. To effectively wash stovetop irons, you will need to immediately wipe off the crumbs and grease from the iron plates while it’s still hot. Doing so will allow for easy cleaning since the food stuck on the plates will be easier to remove. Traditional stovetop irons also require seasoning before use. This means that after cleaning, you will need to wipe the whole plate with oil before storing it. As for bare-metal electric irons, they require a method of cleaning that’s similar to that of traditional stovetop irons. Just like traditional stovetop irons, bare-metal electric irons also require seasoning before and after use. You will need to season these bare-metal electric irons to prevent the metal from turning brown overtime. Non-stick pizzelle makers, on the other hand, are the easiest to clean. Since these pizzelle makers come with non-stick coatings, all you will need to do is wipe them clean after use and keep them completely dry before storing. Some non-stick pizzelle maker models even come with removable plates that you can wash in the sink with soapy water. Just make sure that you don’t use any material that can scratch off the non-stick coating during cleaning. Choosing a pizzelle maker isn’t that hard. 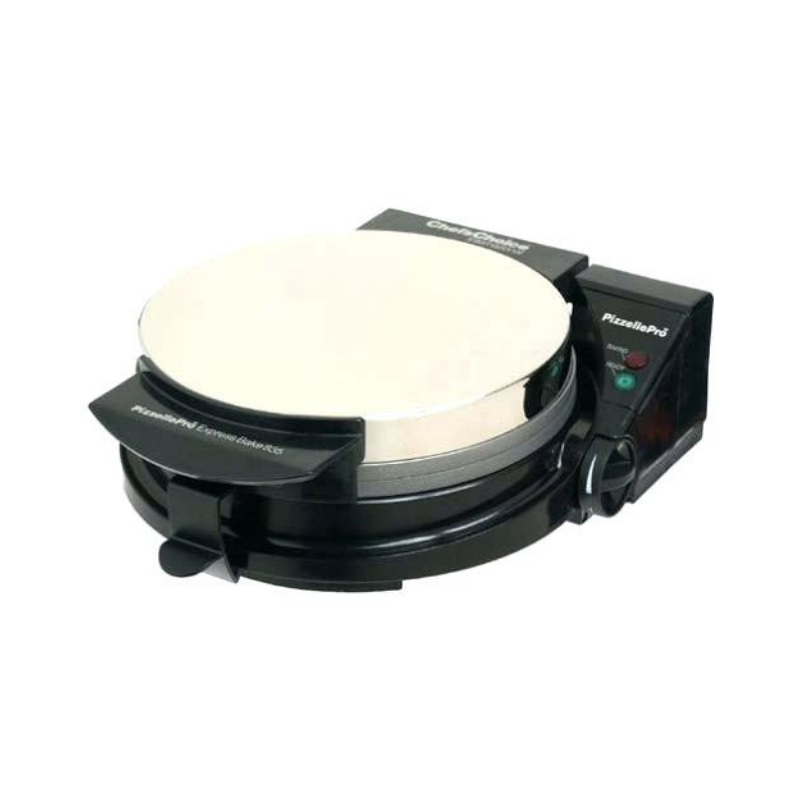 In today’s market, you will find different kinds of pizzelle makers that can fit your personal needs and preferences. You might also want to set your sights on non-stick pizzelle makers. 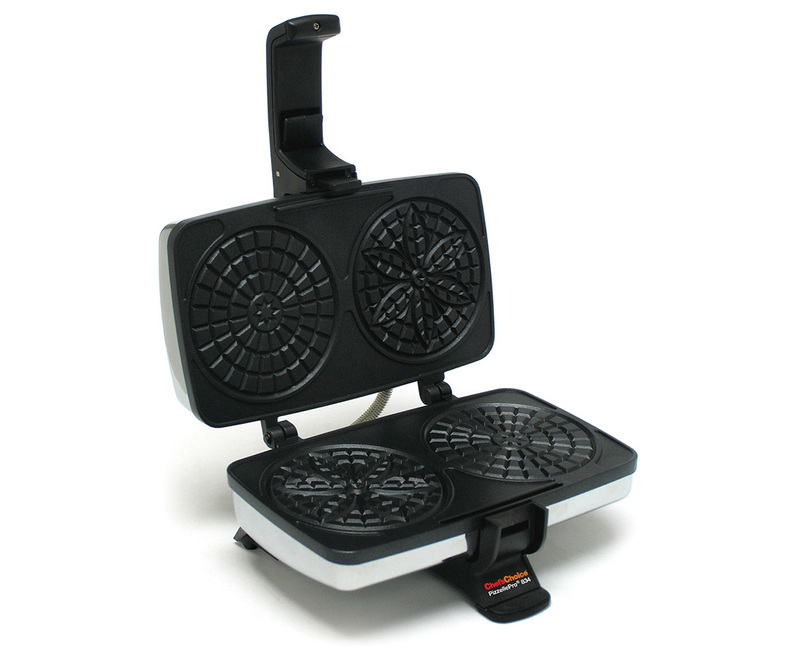 Because these have non-stick coatings, the mixture for the pizzella is unlikely to stick to the surface, thereby reducing the chances of broken pizzelles and thereby making it easier to clean your pizzelle maker. 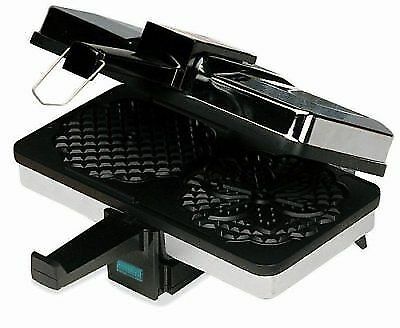 Also try to choose a pizzelle maker that comes with plates that can effectively maintain the proper heat temperatures. Doing so will ensure that you get thoroughly cooked pizzelles. This way, there are no uneven spots or burnt parts. Another thing you may want to consider is the plate design. Some pizzelle makers come with plates that have multiple plate designs, allowing you to create pizzelles with different patterns at the same time. The last thing you should consider is the capacity of the plates. Some pizzelle makers will only allow you to create one piece at a time, while others can allow you to create two at the same time. At the end of the day, all you have to make sure of is that you get something that you will be happy using. Because otherwise, you might end up getting something that you would just regret buying. Of all the pizzelle makers in this list, this one is probably the best for making multiple pizzelles at once. This pizzelle maker can help you create three pizzelles in just under a minute. It even comes with non-stick plates that will allow for easy removal of pizzelles. Talk about seamless cooking, right? Another interesting feature of this pizzelle maker is that it comes with an overflow channel that will allow for less clean ups when you put too much batter into the iron. The electronic controls also make it easier for you to operate this machine. This product also comes with a lot of freebies including recipes, a cannoli dowel, and a batter spoon. 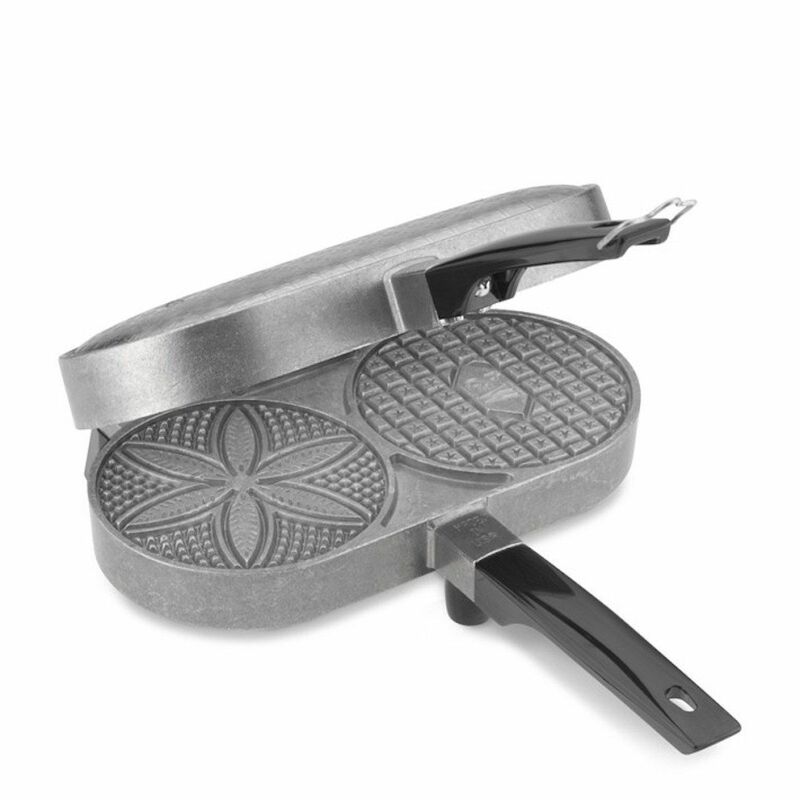 This pizzelle maker can help you create perfectly-cooked pizzelle cookies because it comes with cast aluminum plates. Its cast aluminum plates can effectively retain the proper heat temperatures even when you are opening and closing the plates, making consistent cooking really easy. Aside from being able to retain heat effectively, this pizzelle maker can also help you cook batches of pizzelles really quickly since it comes with multiple plates. Other factors that make this product an attractive buy is the fact that it comes with a highly reliable 5 year manufacturer warranty and a free cone roller for added flexibility during cooking. If you are looking for a pizzelle maker that wouldn’t require you much effort, this is probably the best choice for you. This pizzelle maker will allow you to create two pizzelle cookies at once within just 30 seconds. 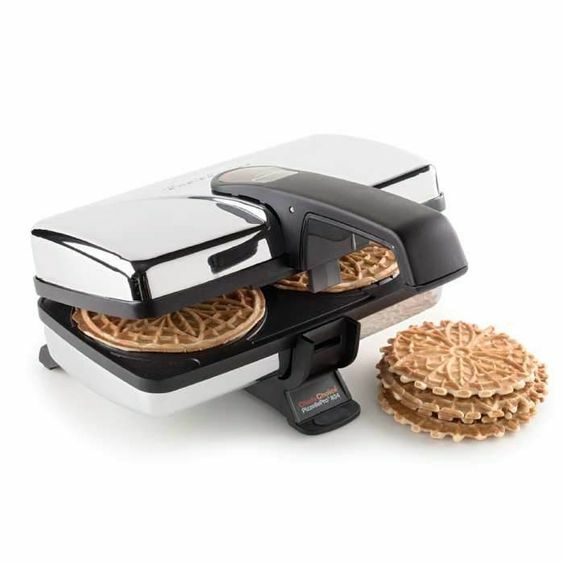 What’s more is that this pizzelle maker comes with a non-stick coating that will allow for seamless removal of the pizzelle cookies from the plates. No more worries of ruining the cookies even if it’s your first time making them. 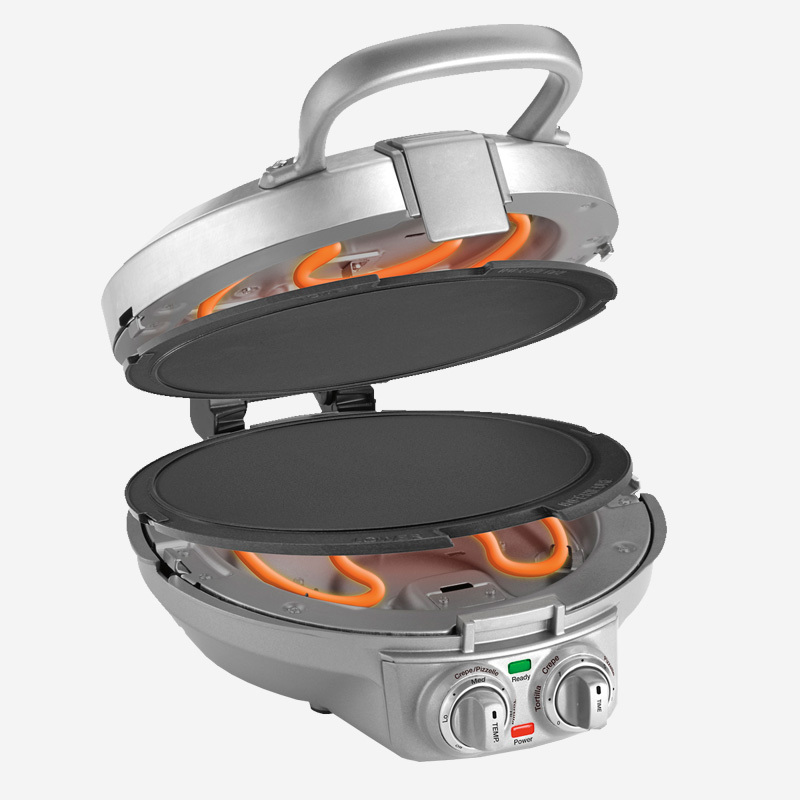 Another interesting feature of this pizzelle maker is its locking hatch that will allow you to create pizzelles with even thickness. This feature is very handy because creating evenly thick pizzelles is something that requires practice. Other factors that may make you consider getting this pizzelle maker is that it comes with free recipes and it can be used to make cannoli. This pizzelle maker can help you create multiple pizzelles with different patterns at the same time because it comes with two plates that sport different patterns. If you are looking to create a batch of pizzelles with different designs, this could be the right choice for you. Another thing that makes this pizzelle maker a great buy is its lid lock feature that will allow you to create pizzelles with an even thickness. A feat that no beginner can easily achieve without ample time to practice. If you decide to get this pizzelle maker, you will also get a free measuring spoon and a rolling dowel that you can use to make cannolis. This pizzelle maker is another fast cooker in this list. It can help you create 2 pizzelles in just 30 seconds. Its plates even come with those traditional fiori patterns that will add authenticity to your pizzelles. Another factor that makes this pizzelle maker a great buy is that it comes with non-stick plates that allow for seamless cooking. It even comes with handy light indicators that will tell you when the machine is ready for cooking. This product is also very safe to use because it comes with a steam guard that will prevent your hands from getting burned when the steam comes out of the pizzelle maker. Which One Should You Get? All these pizzelle makers are ideal choices for home use. But since you only need one, you would want to narrow down your options. The Chef’s Choice 835 Pizzelle Pro Express Bake is highly recommended for bigger families who tend to have busy mornings and who will need to make more pizzelles in one go. It is capable of making three pizzelles in one go, ideal for those with many school-aged children. For those looking for pizzelle makers that also double as cone makers, try the Palmer Pizzelle Maker Classic. This is perfect for home use or for business purposes. It is more ideal for experienced pizzelle makers since it doesn’t come with a non-stick coating. Get the Chef’s Choice 834 Pizzelle Pro Express Bake if you are looking for an inexpensive pizzelle maker that is also easy to use. It is ideal for the use of beginners but still offers some great features such as the ability to make cannoli. 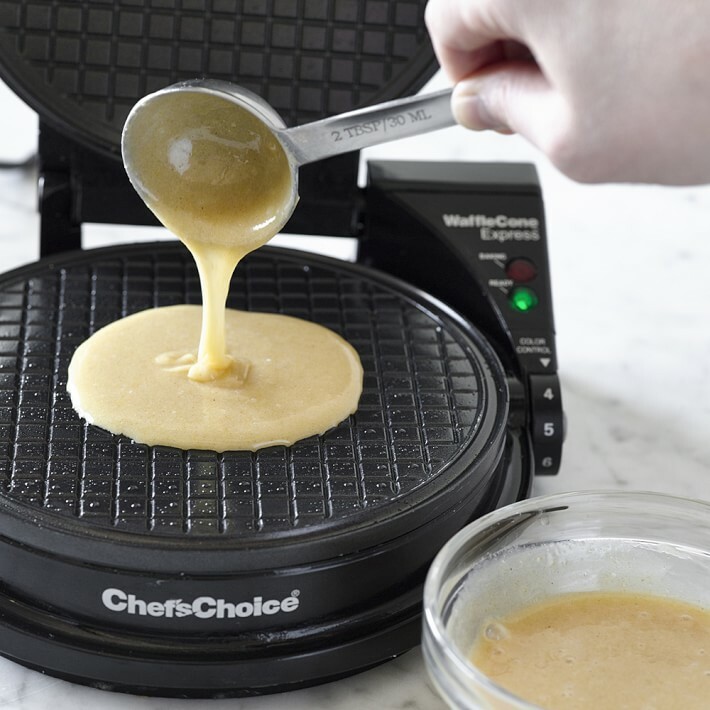 The Cuisinart WM-PZ2 Pizzelle Press is slightly more expensive, but you will actually be able to save money since it also functions as a pancake and crepe maker. This is perfect for those with limited counter space or storage space in the kitchen. The VillaWare V3600-NS Prego Nonstick Pizzelle Baker is for those who have some more room in their budget and are looking for a more beautiful pattern on their pizzelles. 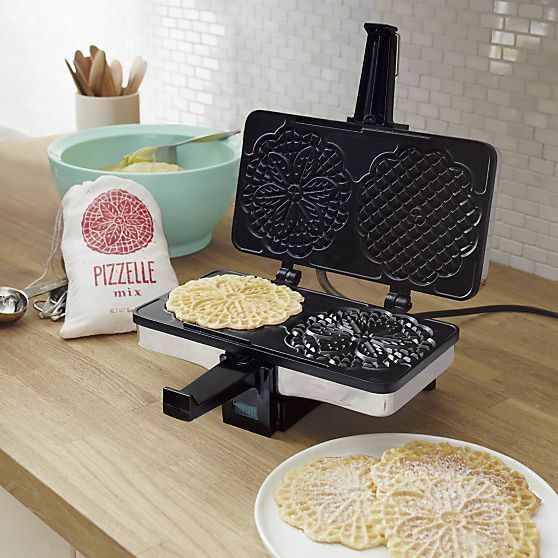 Our favorite pick for best pizzelle maker is the Chef's Choice - it's quick, it makes several pizzelles at once and it comes with a bunch of freebies! Make sure you check out our homepage for more product recommendations. Find out what other tools and equipment for the kitchen are worth spending your money on. Could this article help anyone you know? I am Paula. I have a happy family with my husband and our 2 children. I like cooking and making delicious dishes for my family brings me happiness. I hope to associate with other cooking blogs to have more recipes and we will cook better for our families.